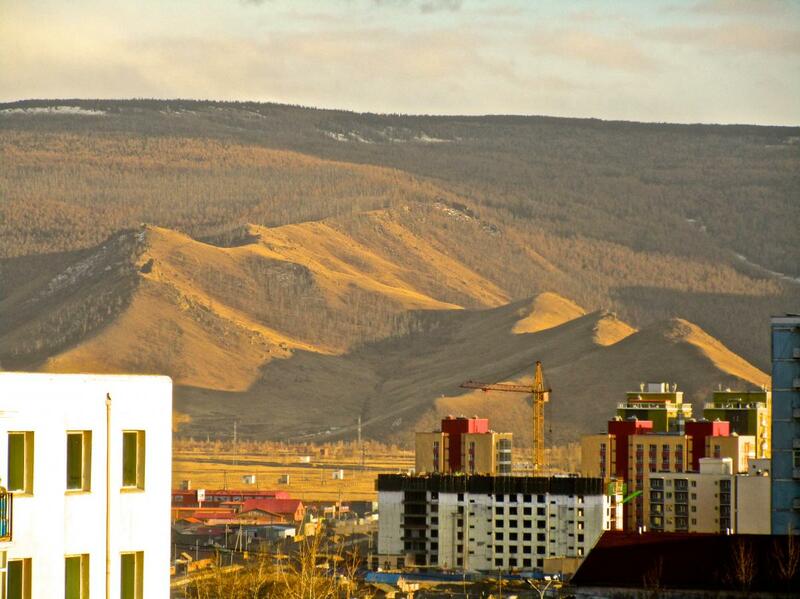 This is a system of four main ridges coming off the north side of Bogd Khan Uul (mountain). These ridges are big and steep in many places, and thus, the name "The Beast" -- given by another rider. Plus, from afar, the four ridges look like the four legs of a massive beast. Though big and steep, these ridges are not as big or steep as others on Bogd Uul, and the trails sometimes take a better line along the contours than other trails on the mountain. So these ridges and their side slopes are much more rideable, but there are still some long hike-a-bike sections going up. The trails are mostly loose over hardpack, but there are also areas of organic dirt (in the forested valleys) and grass. There is some gnar here and there, mostly on the ridges. Some of it is not too bad, but some ridges are quite technical. All in all, the descents are quite fast, except in the more technical sections. Review: Rode The Beast today. It's still all snowpack and good snowpack. Very rideable; usually 30 - 40 cm wide. I wore crampons to push my bike up the mountain. Coming down was great on regular 26x2.35" wheels. No problem. All fun. The really steep sections just required a little more speed control than normal. There are just enough hikers using the trail to groom it nicely for biking but not create ice like Zaisan. The Beast looks to be a nice early season ride. Review: Great ride today! Rode the west ridge. Hiked up through the valley. The top of the trail was still a little muddy in some places. But what a ride out! And side hilling the ridge line to the west was some fantastic single track! I can't wait to hit the east ridge! This is what single track dreams are made of. Review: Rode The Beast this evening. The larch forest is in full fall color -- whole mountain slopes of stunning deep yellows. It's been at peak for several days now. Also, at the top of trail in the forest I heard an elk bugling. He called about 12 times. The first few times he was very close. It was getting late, so I didn't have time to move in on him. Review: I rode most of the trails on the eastern ridges and valleys last weekend. Wow, every trail was good. I preferred climbing up (lots of hike-a-bike) the big valley trail between the two main ridges. It was the quickest and most direct line to the second top where the two ridges come together at the big "ovoo". There is a lot of fun rideable trail above the ovoo. So once you are here, take a break and then keep riding up the mountain. The further you go up the more technical it gets. The ridge above makes for an awesome DH. The two ridges below the ovoo made for great descents too, but they were different from one another. Generally, the ridge descents are flatter and faster on the upper halves and steeper and more technical on the lower. The eastern most ridge is more wide open. On the last quarter of this descent the trail disappears, and it's time to do some classic no track "free riding" on the Mongolian short grass. Finally, the valley trails in the trees can be very steep and are organic. They pretty much drop straight down the fall line. Tons of fun hanging off the back of your bike. Review: I rode the west two ridges this evening. It's a big hike up, but wow coming down is fast fast fast with just enough tech to keep you on your toes and your finger modulating the brakes. It is also quite flowy in place. All in all a ton of fun. Plus, the scenery is great. Big views of the mountain and the city. Review: Big terrain with a few sections that will intimidate many riders, me included. The elevation change is about 1200' or 1300' in about 1.5 mi. Most of the trails go up and down the mountain on the ridges or side slopes, but there are some trails in the valleys also. There are a couple of trails that go across the mountain up higher. Most of the trail is true narrow singletrack. The Beast MTB Trail 4.83 out of 5 based on 6 ratings. 6 user reviews.